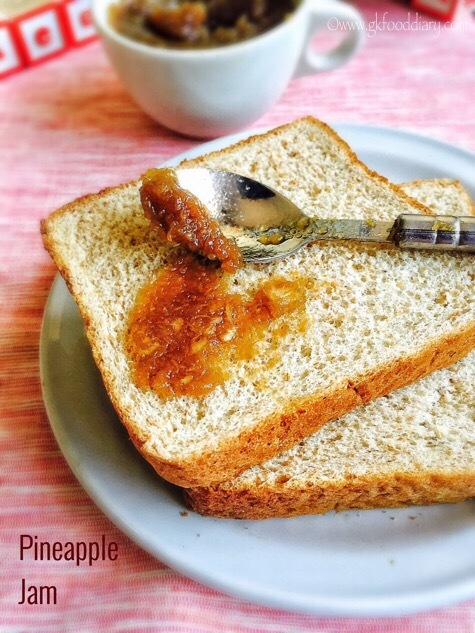 Back with a homemade jam again, this time it’s with pineapples 🙂 I have posted homemade strawberry jam recipe, a while ago , and I have got good reviews for the recipe from friends and readers. So motivated to do more homemade jam recipes:) This pineapple jam is lip smacking and tastes great as such. I made this pineapple jam little chunky, as its tastes great in that way. 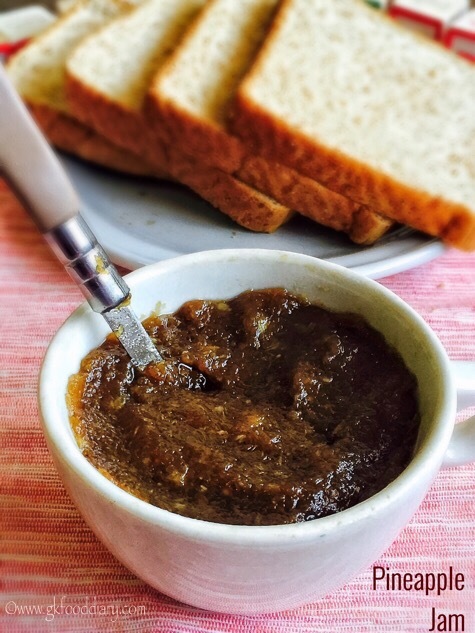 You could consume few tea spoons of this homemade pineapple jam with whole wheat bread, idli, dosa or even roti. You can introduce pineapples to your baby after one year, for more details on the health benefits of pineapples and how to introduce pineapples to your baby, check here. Let’s get on to check how to make this homemade chunky pineapple jam recipe for toddlers and kids. 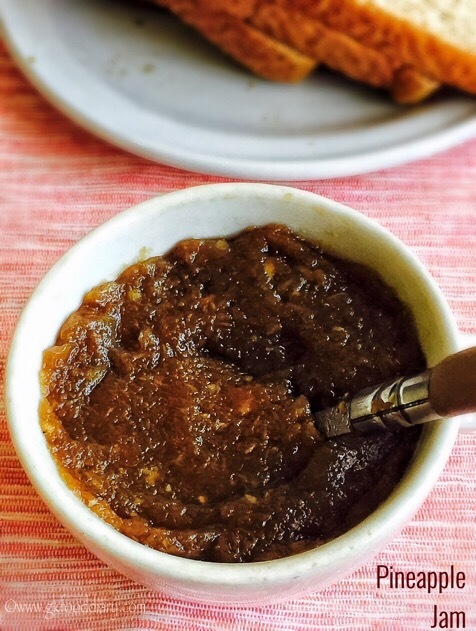 Homemade pineapple Jam - easy, preservative free jam recipe with pineapple and brown sugar/powdered jaggery. Wash the pineapple in running water thoroughly. Place it on a cutting board and cut off the stem and base of the fruit. Cut them in the centre into two parts. Make it stand on its end, remove the skin using a sharp knife. Then slice it, cut out the sharp parts in each slice and cube them. 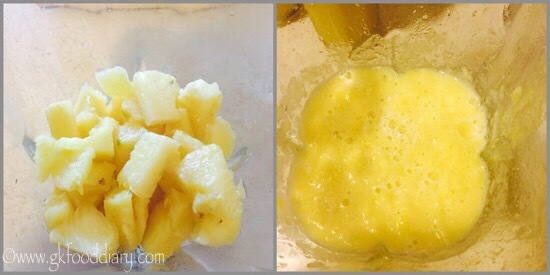 Blend the pineapples in a blender until smooth (leave some pieces of pineapples here and there if you wish). Add little water while grinding if necessary. 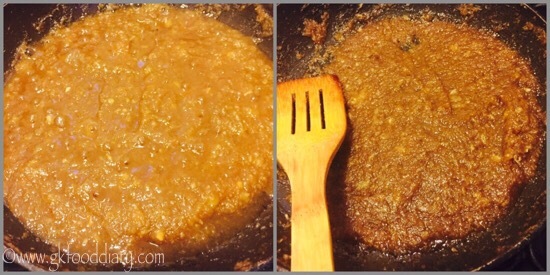 Transfer the blended pineapples into a pan and add sugar/jaggery powder. Mix well. Then add lemon juice and give a quick stir. Stir it for 10-15 minutes until it reaches jam like consistency. Keep the flame low to medium to avoid burning at the bottom. Switch off the flame once done. 1. Wash the pineapple in running water thoroughly. Place it on a cutting board and cut off the stem and base of the fruit. 2. Cut them in the center into two parts. Make it stand on its end, remove the skin using a sharp knife. Then slice it, cut out the sharp parts in each slice and cube them. 2. Blend the pineapples in a blender until smooth (leave some pieces of pineapples here and there if you wish). Add little water while grinding if necessary. 3. 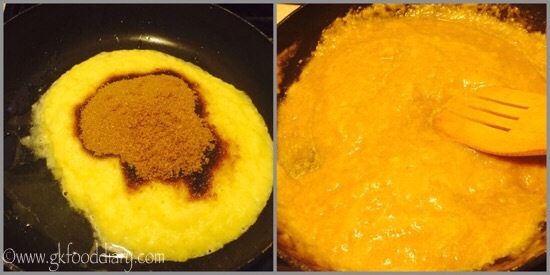 Transfer the blended pineapples into a pan and add sugar/jaggery powder. Mix well. Then add lemon juice and give a quick stir. 4. Stir it for 10-15 minutes until it reaches jam like consistency. Keep the flame low to medium to avoid burning at the bottom. Switch off the flame once done. Yummy homemade pineapple jam is ready! 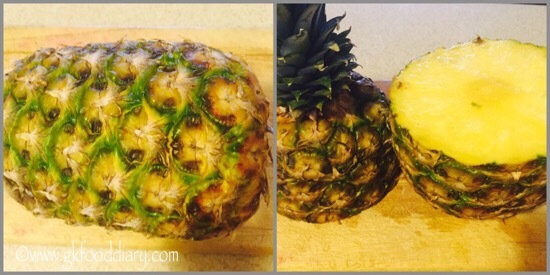 Choose well ripen and sweet tasting pineapples for better results. Use a clean jar to store the jam. If preparing the jam in large quantities, I would suggest to sterilize the glass jars. Check the jam consistency by place a spoonful of jam in a plate and cool it down. After cooling down, if no water separated then its the correct consistency for a jam. The quantity of the sweetener depends on the sweetness of pineapples. You can use white sugar instead of brown sugar/powdered jaggery. You will get a nice yellow pineapple color if you use sugar. But to make it healthy, always use brown sugar or jaggery. 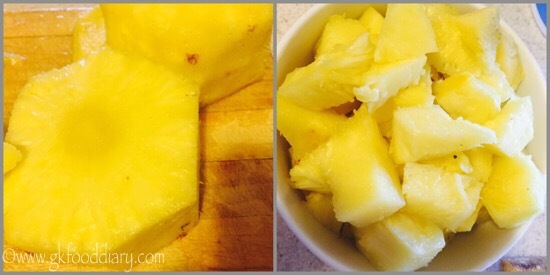 You can blend the pineapples completely smooth or little mashed. It’s completely your preference. This pineapple jam becomes little thick after cooling down so switch it off the flame accordingly. Don’t over boil. Keep it refrigerated and consume with in a couple of weeks. But it keeps well for a month if handled properly. Always check with your pediatrician before introducing any new food. How long can we store this in fridge? Ok thank you. Can i store in steel box as I don’t have glass jar. Also i didn’t add lemon juice as I don’t have it at home.